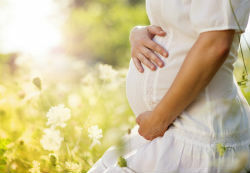 During the first trimester of pregnancy, most women “feel” pregnant with at least a little bit of nausea and fatigue. By now the hormone levels necessary for growing your uterus and your baby are elevated, causing an emotional and physical metamorphosis that is pretty much beyond your control. Embrace these rapid changes. Remind yourself that your experience, while temporary, is very unique—you’re the only one to carry this particular child. When you consider that you are creating another life in just nine short months, the inconvenience and discomfort become secondary. as unsettled as your stomach. Remember that it is normal to feel both happy about growing a baby and not so happy about the toll the first trimester of pregnancy takes on your mind, body, and lifestyle. The pregnancy hormones that are growing your baby also start enlarging your breasts. Breasts typically increase one cup size during the first trimester of pregnancy and another cup size during the rest of the prenatal period. These changes are stimulated by a surge of hormones that stimulate the growth of milk glands. Remember to be kind to your breasts during pregnancy. Enjoying the comfort of frequent, warm showers and a very gentle breast massage can help alleviate some of the discomfort you may feel. The occasional bouts of tiredness you experienced in your first month may now give way to total exhaustion. Last month you wanted to rest, now it’s nonnegotiable! This feeling is nature’s way of compelling a busy woman to slow down and direct her energy where it is, for growing her baby. You may find that you have to walk more slowly and that you get out of breath more easily, even during normal walking. For your own sake and your baby’s, listen to your body’s messages and rest as much as you can. If you have a demanding job (or toddler) and sleeping more isn’t an option, at least try to get off your feet more often. Morning sickness often peaks mid-way through the first trimester of pregnancy. Hang in there! As you’re wondering why you ever got yourself into this, a friend or your doctor offers the cheery dismissal, “Oh, that’s just your hormones. Nausea is a sign your baby is healthy.” True enough, perhaps, but not much comfort when you feel seasick around the clock. Most moms don’t think they will have to deal with drooling until baby arrives, but around the second month the amount of saliva they produce can increase quite a bit. The taste can change, too, even becoming somewhat metallic. Yuck, right? The cause of this phenomenon is not understood, but it does no harm. Some mothers find this alleviates their heartburn but some mothers find it makes them more nauseous. In any event, it usually lessens by the end of the first trimester of pregnancy. If the taste bothers you, try sucking on a mint or lemon drop or brushing your teeth with a minty toothpaste. Naturally, as you are making more blood to grow a baby, the necessary blood volume going through your kidneys results in more frequent urination. In addition, your growing uterus resides right behind your bladder and definitely makes its presence felt on a regular basis. Though you will continue to urinate more frequently throughout your pregnancy, the increased “urge to pee” is typically most noticeable during the first three months. If you are not urinating more frequently during the the first trimester of pregnancy, it is a sign you may need to drink more fluids. Thirst is your body’s normal signal that you and your baby need more fluids. If you don’t listen to your thirst signals you may become dehydrated, which only aggravates nausea and fatigue. Your body needs more fluid because your blood volume increases by 40%. Drinking extra water helps flush the extra waste from your kidneys. Since thirst is not an accurate guide of how much water you need, drink until you are no longer thirsty. Above all, don’t drink less so you will pee less; that’s not good for you or baby. Other than drinking water, try sucking on ice chips or homemade popsicles, drinking coconut water or a smoothie, or eating foods with high water content, such as melons, to stay hydrated. Early pregnancy hormones slow the movement of food through your intestines. The slower passage of food and fluid allows more water to be absorbed. The combination of slower movement and increased absorption of fluids leads to harder stools. Good bowel habits like grazing, eating more high-fiber foods, drinking more fluids, exercise, and taking probiotics will help ease constipation during the first trimester of pregnancy. As your gut and growing baby are learning to get along, the same intestinal upsets that cause constipation also give you gas. Try eating less of the common gassy foods such as broccoli, cabbage, cauliflower, Brussels sprouts, beans, and carbonated beverages. Also avoid greasy and fried foods, since food with high fat content take longer to empty from your stomach and intestines. Shortly after eating, and sometimes even between meals, many pregnant women belch and burp and experience a burning, irritating sensation just below their breastbone. Once again, your hormones are the culprit. Pregnancy hormones cause an overall slowdown of the intestines, relax the stomach muscles, and delay the time it takes for food and gastric acids to be passed from the stomach. Pregnancy hormones also relax the protective muscles at the entrance of the stomach, so it’s easier for food and acids to travel into the lower end of the esophagus when the stomach contracts. The medical name for this is gastroesophageal reflux (GER) and is also responsible for the uncomfortable sensation known as indigestion. Many women feel cramps in their lower pelvis during the first trimester of pregnancy. These are generally “growing pains” and are a symptom of the ligaments that stabilize the uterus stretching. You may find that these subside after the uterus begins to grow up over the pelvis bone but can return every now and then, especially if you overdo it – another way your body tells you to slow down.